Discovering new food and engaging in conversations over meals is one of the best ways to get to know other students, especially when you join us without knowing other students. Morgan Strongosky, a senior at Florida State University, is enjoying all the Greek culture has to offer! So far my experience in Greece has been absolutely breath taking. 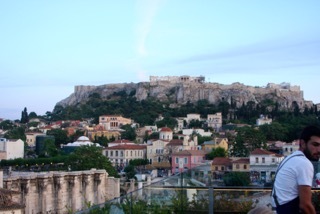 I have been so lucky to be on this journey and to explore such an amazing country by touring the Acropolis, hiking the Castle of Corinth, bungy jumping, and tasting the delicious food. It is only day 5 here and I feel like I have been in Athens, Greece, for weeks due to all the adventures I have accomplished. I am going to elaborate on the culture of the food by starting off with my favorite place which is 360 degrees. I went with a group of awesome girls into the city of Athens and seriously did not stop smiling once. The taxi rides to and from were quite the adventure but we some how made it back safely to our destination. Anyways, the restaurant, 360 degrees, was outstanding in the since that we ate on a glass walled rooftop over looking the Parthenon! A picture would not do it justice. Moving on, I had the most amazing pasta dish, which consisted of chicken, pasta, and an amazing sauce. Not only was the food amazing but also the girls were so fun and easy going. I really got to know them well and make connections that I could see lasting for a lifetime. Another one of my favorite food restaurant is called Gazi College. Now I am sure you are thinking that does not seem to be very greek oriented and it isn’t but the atmosphere there is so welcoming. They have great comfort food such as hotdogs, pizza, pasta, burgers, and so on. I have eaten there twice and have ordered the caesar salad once and then the pizza secondly. Both were delicious! I also tried a warm waffle with nutella and ice cream on top which seriously was mouth watering. I did not know if I would really enjoy greek food but I am finding out that I am liking it more than I thought. When we had our welcoming dinner with all 74 students, we ate at a place called Cheers in Athens, which served us an eight course meal of all the common greek foods. I was proud of myself because I had tried 7 out of the 8 dishes and that one dish was mushrooms. It was really neat to experience the greek culture and how they do their meals over several dishes. All in all this has been a great experience and opportunity for me! I am so happy I was selected to join this wonderful group of people and meet them while sharing memories with each and every one. I came into this group not knowing anyone so I was ready for anything that would be thrown my way. I have already made great new friends and I cannot wait to see what 3.5 more weeks will do.